40 organized religions and faith groups. The symbols of fourteen religions are shown. 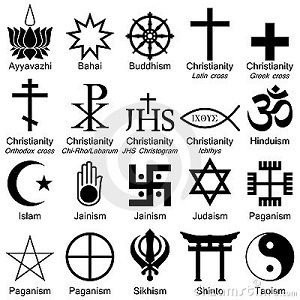 Clockwise from the North Pole, they are mostly in alphabetic order: Baha'i, Buddhism, Christianity, Confucianism, Hinduism, Islam, Jainism, Judaism, Shinto, Sikhism, Taoism, Wicca and some other Neopagan religions, Zoroastrianism, and Druidism. If the Wiccan symbol is flipped by 180º so that one point is towards the center, it becomes the symbol of an unrelated religion, Satanism. This graphic was donated to us along with the copyright. We are making it available free of charge to anyone. philosophies, spiritual paths, etc is located elsewhere on this site. "Islam doesn't promote violence or peace. Islam is just a religion. And like every religion in the world, it depends on what you bring to it. If you are a violent person, your Islam, your Judaism, your Christianity, your Hinduism is going to be violent." Part 1: Our logo, again. Religious symbols. Quotations. Introductory thoughts. Part 2: Introductory thoughts (Cont'd). Animated map showing religions over time. Other inclusive religious web sites. Part 3: Inclusive web sites. Books on world religions. Find a faith group that matches your beliefs. A final recommendation. Disclaimer. 3Neopagan faiths are modern-day reconstructions of ancient Pagan religions from various countries and eras. They experience a serious but diminishing level of discrimination and persecution in North America. They were once rarely practiced in public for reasons of safety. This are now generally accepted in North America as legitimate religions, except among religious conservatives. Many followers of Asatru refer to themselves as "Heathens" rather than "Neopagans. " Many followers of these religions refer to themselves as "Pagans." We use the term "Neopagan" because it is less ambiguous. "Pagan" has a variety of unrelated meanings. About the largest religious groups in the U.S.
Resources on religious beliefs and practices for chaplains, medical personnel, hospital personnel, and anyone else dealing with the public. Selecting holy texts from the world's religions for public meditation rooms, personal library, etc.. Moon symbol courtesy of Jaz's Pagan Page.